Find out what our experts have to say about Royal Enfield Bullet 350! The Bullet 350 is the cheapest bike from the iconic Indian two-wheeler manufacturer and is for the Royal Enfield purist. It retains the old-school lines but features the updated 350cc motor. Electric starter is an optional extra and will be our pick for the marginal premium. The least priced variant is Royal Enfield Bullet 350 ABS priced at Rs. 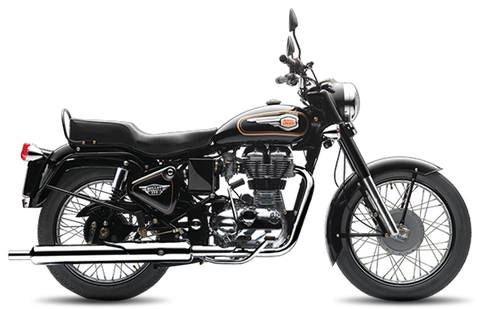 1,39,544 and the most priced variant is Royal Enfield Bullet 350 Electric Start (ES) ABS priced at Rs. 1,55,155. Choose the Royal Enfield Bullet 350 which fits the bill of you. The Royal Enfield Bullet 350 is a perfect example of a motorcycle which can carry all the charm of the motorcycle which belongs to the early heydays of motorcycling, without being looking dated. This old-school motorcycle carries all the classic aura which a vintage motorcycle carries throughout its silhoutte. The overall design and riding feel take you back to the mid decades of 20th century, with its appeal and stance. This motorcycle is a perfect example that a dated design can still taste good to the modern tongues. To be more specific, the Royal Enfield Bullet 350 carries the design of the early '40s of the past century, in a more enhanced manner. The body parts, while still resembling the original Bullets, are still in symphony with the overall stance. The chrome finished rounded headlight in front along with body colored suspension bits and front mudguard clearly signify you that this motorcycle is down to its business off being a retro machine. The fuel tank is rounded and gels well with the overall design. The rear and side body panels are minimalistic with battery covers finished in body color. The rear sports a tail light reminiscent of the old Bullets, along with the old round orange turn indicators. The things which make the Bullet 350 so special are the metallic old-school Royal Enfield emblem and hand painted stripes on the fuel tank. The instrument console follows a simplistic approach with an analog speedometer, odometer and battery indicator. The absence of fuel gauge reminds you back to its old-gold appeal, but then, it should have been given for modern day functionality. The build and fit and finish is average with few niggles here and there. Royal Enfield engines are known for their famous 'dug-dug' exhaust note, and the Bullet 350, being the initiator of it, still carries the same tune even today. The engine is a large single-cylinder, carburetted, 346cc unit, which makes out a meagre 20 PS of power and 28 Nm of torque. The specifications may not sound that great as the exhaust sound, but thanks to the availability of that torque at a lower rpm, the driveability of the engine is fantastic. Power delivery is smooth, though the 5-speed gearbox is notchy, and you may end stuck in wrong gears sometimes. The refinement word is what this motorcycle hates, and may sound too harsh at high revolutions. The Royal Enfield Bullet 350 is just not a motorcycle. Its a legend and it acts so. The way it looks and rides, gives it a commanding feel that none other bike below 500cc can do. You get instant respect by passers-by and vehicles once you take this imposing machine on the roads. Sure, the Bullet 350 isn't for everyone, but it's for those who respect the aura of old era of motorcycles and loves and respects a motorcycle despite of its flaws.